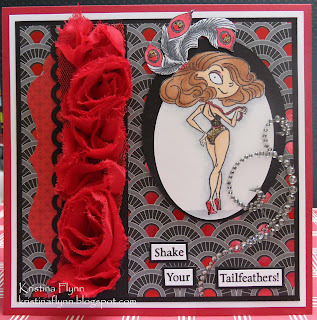 I love this image - "Vivienne" from Kraftin' Kimmie Stamps. She is so sassy. The Patterned paper is from Kaiserkraft. A close up of the image - coloured with Copics. It's a bit hard to see but I used some stickles on her outfit and in the feathers. I also used glossy accents on her high heels, necklace and feather centres.